When Deadpool did the unthinkable and killed Agent Phil Coulson for Captain America, it did more than prove his loyalty: it earned him a spot as Hydra's top assassin. 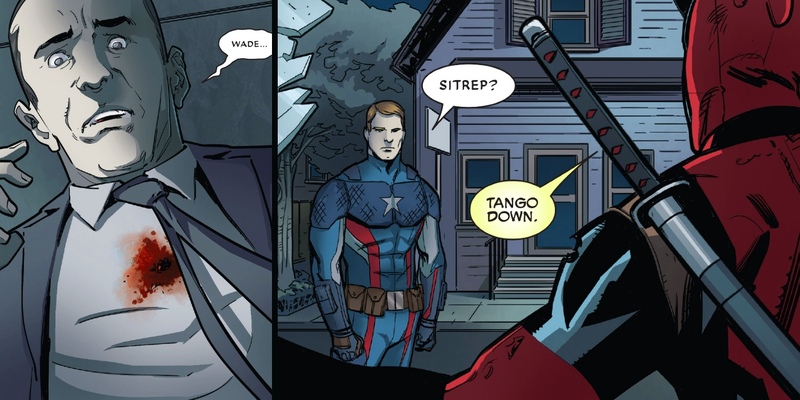 In the zany mercenary's defense, Wade Wilson didn't know exactly what he was doing, or why he was doing it when Steve Rogers sent the order to kill Coulson on sight. Deadpool didn't know what the readers did: that just hours before Captain America launched his Hydra takeover, Phil Coulson had discovered the secret plot and attempted to stop it. The heartbreak from seeing his lifelong idol turn into a villain would have been bad enough, if not for the literal heartbreak caused by the bullet Deadpool planted in Coulson's chest. But when you also grow up idolizing the infallible hero Captain America, only to have him offer you membership as an Avenger in your adult years, you do as he asks. Even if it means killing one of the government's most trustworthy and beloved agents - an agent who, according to Steve Rogers, had become an enemy of the United States. The twist there was that what Steve Rogers really meant Phil Coulson had become a threat to his Hydra-occupied United States, and had to be removed as a result. And when the deed was carried out, and Coulson left bleeding on the floor of a burned-out diner... Steve was there to welcome Wade Wilson into the arms of friendship. For those who missed out on the event in the pages of Deadpool #31, it was clear Steve Rogers recognized that even Deadpool might not have a taste for killing former allies for political purposes. Wade Wilson had questions, and Steve promised that they would be answered soon enough (probably when Hydra took over America and outlawed the people who had protected it). Calling the murder of Phil Coulson a "necessary sacrifice" to being "watering the tree of liberty," Steve left the scene to launch the rest of his hostile takeover. But as Cap strutted away from the burning building, claiming that this act had shown Deadpool could be trusted to do what was "necessary," Gerry Duggan and Matteo Lolli focused on the speechless Merc With a Mouth. He stayed behind to gaze into the flames, having partially collapsed with the weight of executing Steve's order. He may be a loyal Captain America fanboy, but even before his formal recruitment into the ranks of Hydra's top trackers and killer... he was showing some doubt. That's a thread picked up in Deadpool #32, as Wade has stepped into a new life at Steve Rogers's right hand. Well, when we say "at the right hand of Captain America," we actually mean that Steve Rogers doesn't make an appearance (no surprise that his disappointment and betrayal seems to spread to just about everyone). Instead, Deadpool is left with a new mission: to track down the mutants, superheroes, and former S.H.I.E.L.D. agents who now make up the leadership and ranks of the Resistance. The part of the organized resistance that wasn't killed when Captain America wiped out Las Vegas to kill them. 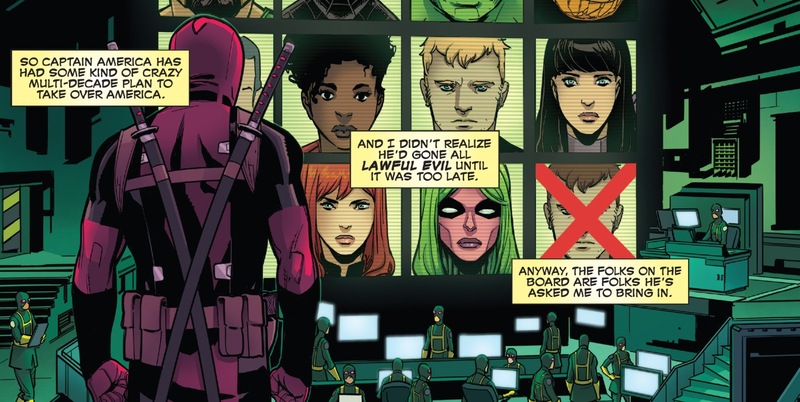 The good news for Marvel fans (and the resistance heroes themselves) is that Deadpool is only being paid to track down and apprehend the outlaw heroes - NOT kill them on sight. Again, it's hard to know just how safe their future is, but at least outside of Nick Spencer's mainline Secret Empire series Cap is keeping the body count to a minimum. Which means when Deadpool sets out to track down Speedball (having evaded Hydra thanks to his deflecting powers), it's Wade who winds up taking the worst of their encounter. Needless to say, calling in his Hydra brothers to take in their latest catch, and the "silver" he earns for it are less than satisfying. 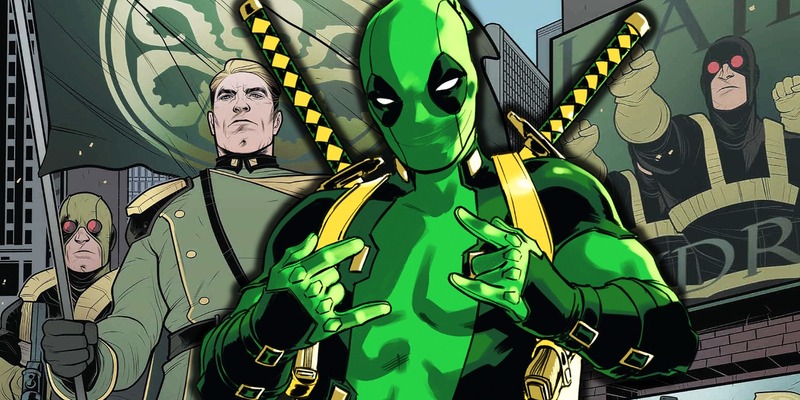 Longtime fans of Deadpool may be surprised to hear it, but as Captain America's Hydra empire continued to tighten its grasp on the country, Wade Wilson seems to be among the few loyal to Cap who are already growing disillusioned. The mention of the "silver" he's being paid for taking down former heroes is a strong hint at the Judas he now sees himself resembling. And as Wade kills time in his Washington apartment, or drives by the fanatical Hydra soldiers burning books, it's clear that he's not drinking the order's Kool-Aid. Never one to bend to an authority figure or ideology, readers are already seeing Deadpool's frustration manifest. Aside from his subtle shots at Hydra's mantra ("Kale Hydra! "), Wade is among the first to discover the location of the Resistance headquarters. But his hesitancy to report it to his superiors may spell a switch of allegiance in the near future. How Captain America will take it... well, Deadpool inability to be killed may come in handy. Deadpool #32 is available now.